This event was held at the Loudermilk Center in downtown Atlanta. It proved to be a great location for both attendees and sponsors. Many sponsors were stationed on the main floor and SiteLock and GoWP were positioned upstairs, directly next to two session rooms. This gave us the perfect opportunity to speak with the awesome people of Atlanta before and after their sessions. This change in mindset turned out to be a theme with many of the sessions, including my own. We are huge proponents of promoting technology to the next generation, so we loved this idea of having a dedicated day for the children of WordCampers to learn all about WordPress. The Kids Camp organizers even took the extra time to take the kids to each sponsor table and tell them what we do. We were a bit unprepared to break down the complexity of website security to such a young crowd, but by using the analogy of “locks on doors and windows,” we think it sunk in just fine. It was pretty clear the kids were having a great time. Free t-shirts and other swag items, not to mention the temporary tattoos! 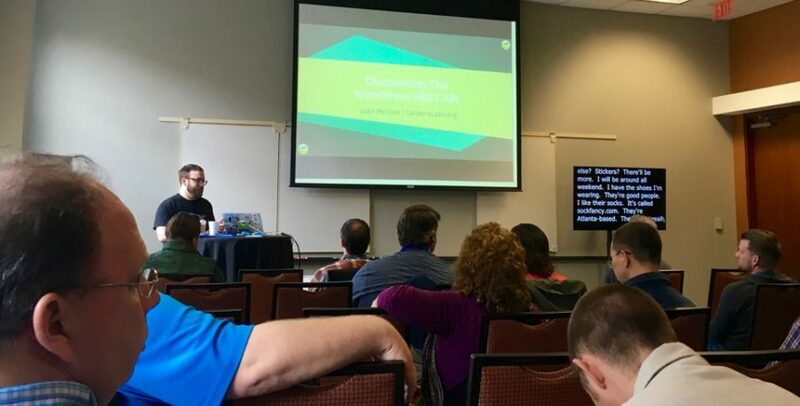 Another great session was Josh Pollock’s talk titled “Discovering the Content Endpoints of the WordPress REST API.” This discussion was fantastic for both beginners and advanced developers. It was a nice mix of what’s possible with the REST API and a deeper dive into exactly how to access content with code. You might notice that we’re big fans of the REST API and what it means for the future of WordPress from our previous post. It’s nice to see so many new talks about this subject at recent camps. It’s clear that great things are to come for the WordPress platform, the community, and the average internet user because of the REST API. We’ve referenced this already, but it should be said again. The organizers did a fantastic job with the “finding gold” theme of this event. In fact, even Adam’s talk “WordPress as a Vehicle for Any Business: Visualizing and Achieving Success,” shared his story of finding WordPress and how it became his passion. His love for WordPress eventually led him to the creation of his own plugin business and securing his position as one of SiteLock’s “boots on the ground” in the WordPress community. The key takeaway was that not only is following your passion the key to happiness, but how WordPress and the community can help make that happen. Bridget Willard’s talk was at the end of the last day of camp, which seemed fitting because it was an excellent call-to-action to each and every one of us. In her talk, “Meetups: Why is it important to invest in the WordPress Community?“, Bridget shared her story of feeling alone and eventually breaking that isolation through attending her first WordPress Meetup. Bridget was inspiring, engaging and direct with the crowd. “You Matter!” she cheered. The entire organizing team and a large group of volunteers deserve a lot of credit. Not only did they pull off an amazing event with 600+ attendees, but they made it look seamless while still attending to the special needs and requests of sponsors. Thanks for a great event! Follow us on Twitter at @SiteLock for live updates at our next event.